TOKYO (Reuters) - Japanese Economy Minister Toshimitsu Motegi and U.S. Trade Representative Robert Lighthizer will likely hold a second round of trade talks on Sept. 21 in the United States, a source familiar with the matter told Reuters on Wednesday. Tokyo wants to avert steep tariffs on its car exports and fend off U.S. demands for a bilateral free trade agreement as Japan is wary such an agreement would increase pressure the Japanese government to open sensitive markets such as agriculture. 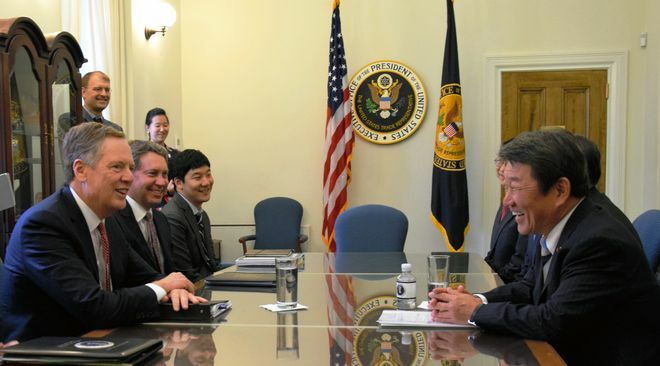 Motegi and Lighthizer acknowledged the importance of expanding trade between the two nations at their first round of meeting in August, and explore ways to bridge their differences.